An Electrical Connection Apparatus for automotive batteries having, in its preferred embodiments a multi-purpose screw threaded bolt with an enlarged head which can be inserted into the side terminal aperture of a battery to form a terminal post for connection of standard top post cable connector, may be provided with perforations allowing it to be tightened/loosened by any linear object, may be utilized as a tightening bolt for a C clamp type cable connector, and may be utilized in conjunction with branching cables for simultaneous connection to the top and side terminals of dual terminal automotive type batteries. A SURVEY OF POTENTIAL MARKETING WAS DONE AND ,,,WALMART,DISCOUNT AUTO,AUTO ZONE AND SEVERAL OTHER SALES OUTLETS .. THEY ALL WERE VERY INTERESTED. WALMART,AND DISCOUNT AUTO SAID THEY WOULD WELCOME THE CABLE AT ANY TIME FOR IMMEDIATE SALES...THEY REQUESTED SOME SAMPLES TO DISPLAY. 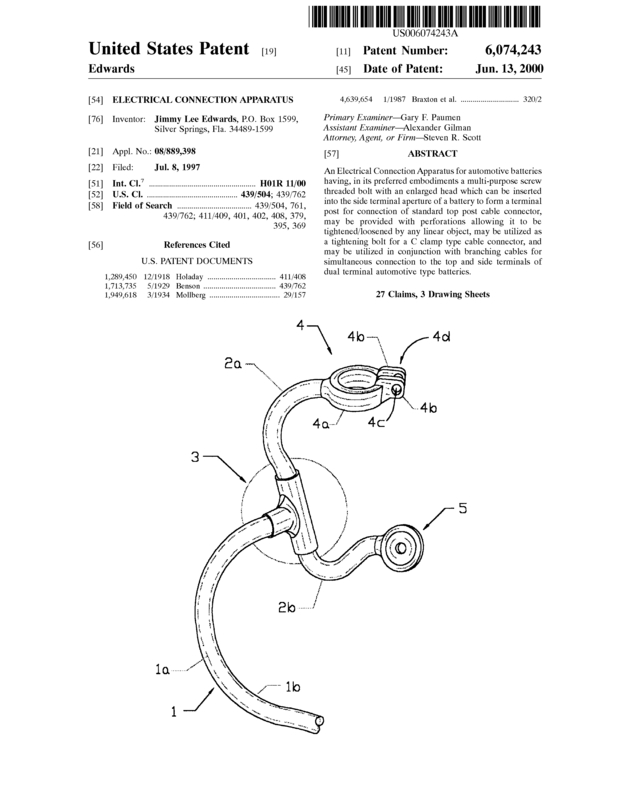 Page created at 2019-04-23 6:43:58, Patent Auction Time.